Out on the water of the shallow bay, large kites dart and dip, pulling riders on boards through the water. Some slice along, creating foamy white wakes. Others use their kites to lift them right off the water and into the air, jumping and twisting. Beginners, struggling to learn kite control, crash their kites into the water with a hollow thwack. 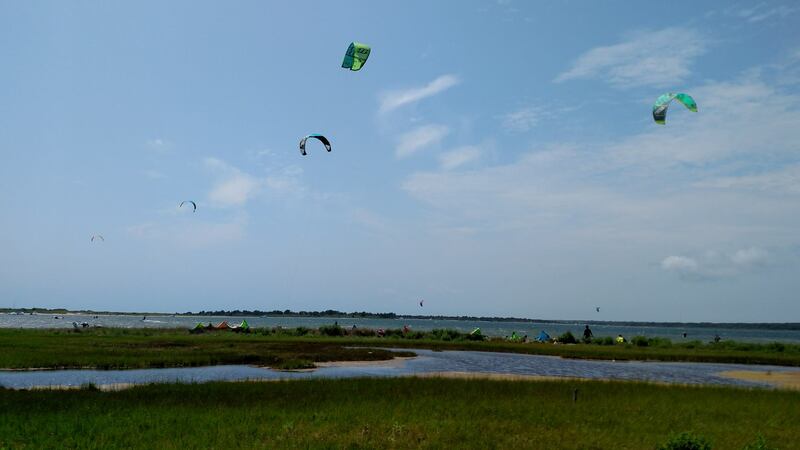 The rainbow of colored, bobbing kites is a beautiful ballet, choreographed above the water and the riders. It is time for my lesson, after many months of inactivity. I take a deep breath and wade out into the water with my instructor, his mere calm presence slowing my accelerated pulse. We talk for a moment, and then he launches the bright orange kite into the air and transfers the bar over to me, clipping it to the harness around my waist. I place my hands on the bar and feel the tug of the kite pulling against my harness, up under my ribs. As the orange crescent-shaped kite dances in the sky above me, my hands relax. I can feel the wind as it plays with the kite, and my hands adjust the bar to keep the kite in position. I let the wind guide it, and in doing so, guide my responses. The spray from a passing rider sheens salt on my lips, and I hear the shush from their wake. The sun creates sparks on the water, and a horseshoe crab seems to tug at my foot underwater. The anxiety that had ebbed and flowed through me for hours quietly falls away, and I shrug it off. It no longer seems to matter what I was or what I felt, just that everything around me is part of a shifting kaleidoscope of color and sound and smell, the sweep of the wind, the warmth of the sun. This entry was posted in Rewording, Spirituality and tagged Cape Cod, environment, fear, kiteboarding, Marcia Amidon Lusted, personal development, spirituality, Waquoit Bay. Bookmark the permalink.